Anyone paying attention to the early stages of the 2020 presidential campaign is probably aware Bernie Sanders -in sharp contrast to his focus in 2016 – now is spending a lot of time talking about foreign policy. For him, the ideological struggle of the 21st century doesn’t pit a liberal, democratic America against illiberal, authoritarian opponents, but instead pits liberal, democratic peoples everywhere against illiberalism at home and abroad. What all this represents is a second phase of the assault on American exceptionalism Sanders launched in 2016. Back then, Sanders challenged the domestic side of the exceptionalist creed: the belief American capitalism — buttressed by shrinking regulations and welfare provisions — provides upward mobility. Now Sanders is poised to challenge exceptionalism in foreign policy: the belief America, as a uniquely virtuous nation, can substitute its own self-interest and moral intuition for international institutions and international law. The term “American exceptionalism,” first formulated by Tocqueville in the 1830s, and since used in general comparative societal analyses, became widely applied after World War I in efforts to account for the weakness of working-class radicalism in the United States …. For radicals, “American exceptionalism” meant a specific question: Why did the United States, alone among industrial societies, lack a significant socialist movement or labor party? As the first self-identified American socialist to run a viable major-party presidential campaign, Sanders really implicitly rejected the deeply embedded idea Americans did not need the sort of safety-net programs, guaranteed benefits, and restraints on corporations that most advanced European and Asian countries took for granted, or at least regularly entertained as reasonable options. Once again, Sanders’ heresies mirror the anti-exceptionalist turn among America’s young. A 2017 Pew Research poll found Americans over the age of 30 were far more likely to say the “U.S. stands above all other countries in the world” than to say, “There are other countries better than the U.S.” But among adults under 30, the latter view predominated by a margin of more than two to one. Whether or not there is a popular majority at this point for the belief, for all its merits the United States is a country amongst countries, rather than being THE country, it’s clear enough Sanders’ domestic and international viewpoints provide the sharpest possible contrast with Trump’s aggressively jingoistic nationalism and the MAGA so-called “alt-right” agenda that goes with it. It’s worth thinking about, since the conventional wisdom suggests Sanders is himself an economic nationalist, whose natural constituency is among the white working-class voters Trump values so much. Looking at how and where he succeeded in 2016, it’s more plausible Bernie really is a pied piper with unusual youth appeal because he just doesn’t speak the old language of American exceptionalism. This may bode well for his 2020 prospects, and suggests he’s an authentic pioneer whose views have a robust future. Bernie Sanders rehabilitated the word. Trump uses it as a slur—and the press follows his lead. On Monday, during a visit to New Hampshire, California Senator Kamala Harris was asked by a reporter if she considers herself a democratic socialist—just as Bernie Sanders, an independent who won the Granite State’s last Democratic primary, does. Over the past three weeks—beginning with his State of the Union address— Donald Trump attempted to turn the 2020 primary into a binary choice between his (corrupt) presidency and Venezuela-style socialism. Many in the media have follow his lead, pressing Democrats on whether or not they are socialists, despite the fact that none describe themselves as such. This pseudo-story not only renders the term “socialism” meaningless in today’s context —conflating national health insurance and graduated tax systems with a government takeover of the entire economy— it erases important distinctions in Democratic candidates’ policies that ought to be our real focus of debate. Understood for much of the twentieth century as a “halfway house between capitalism and communism,” in the words of The Atlantic’s Marian Tupy, socialism has always involved ownership of key industries by the state. None of the major candidates running for the Democratic nomination, including Sanders, are advocating for such an economic model in America. But the term has returned to political prominence nonetheless—first as a rhetorical shorthand on the left, then as ammunition for political attacks from the right, and finally as interview bait from lazy journalists. Few would dispute that Sanders’ surprisingly popular campaign in 2016, when he ran on policies including Medicare for All and tuition-free college, was the most important catalyst for America’s renewed fascination with socialism. It’s also partly the source of the confusion in our discourse about the word’s meaning. 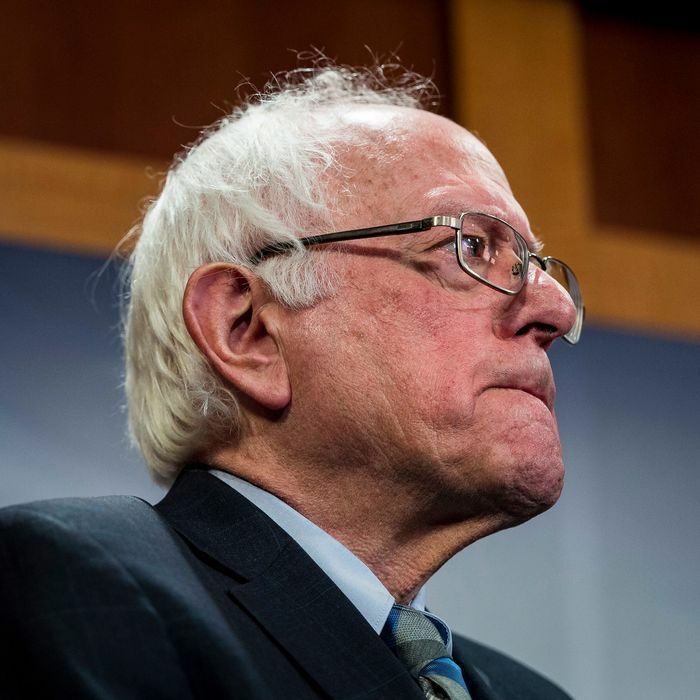 As Thor Benson noted in The New Republic back in 2015, Sanders was “loose with his terminology,” usually making clear that he was a democratic socialist but sometimes simply calling himself a socialist. The policies Sanders embraced then, as now, largely fall under the tradition of FDR’s New Deal Democracy. He’s not pushing for statist control of industry and capital, but more government spending and redistributive policies to drastically reduce —but not artificially eliminate— economic inequality. He advocates for greater worker control over business, but stops short of calling for workers to control the means of production. “When push comes to shove, he is a supporter of a social democratic Scandinavian-style welfare state in the form of better education, healthcare, and social service provisions for the general population, rather than the confiscation of companies from the private sector,” wrote Larry Liu in a prescient post in 2015 about the re-emergence of red-baiting. Donald Trump don’t need no ideology or policy because Donald Trump got steel cage matches!!! Sanders’ loss to Hillary Clinton could have quieted the questions about socialism’s rise in America. Instead, Clinton lost to Trump, and Sanders’s ideas gained even more traction on the left. So have the politics he represents. Since 2016, membership in the Democratic Socialists of America has increased from 6,000 to nearly 60,000. Today, nearly every major Democratic candidate embraces some form of universal health care, along with a host of other ambitious policies aimed at curbing inequality and climate change. Does that make them actual socialists, though? Republicans think so, or at least want voters to think as much. They’re returning to what has been a standard playbook for Republicans, beginning in the McCarthy era and continuing to this day. Over the last 80 years, as recently detailed by historian Kevin Kruse, everything from the polio vaccine to the interstate highway system to the Civil Rights Act have been labeled as “socialism” by opponents. Under President Obama, Republicans argued bailout programs and providing market-based affordable health care were examples of a turn towards socialism. Trump takes aim at socialism, during his speech in Miami, Florida. These attacks from the right are being aided by many in the media, who are pressing Democratic candidates about their devotion to “socialist” positions. Minnesota Senator Amy Klobuchar has built the early phase of her campaign around presenting herself as a sensible Democrat, out to improve social programs but not make them universal. This, in turn, has led The New York Times to frame the early stages of the Democratic primary as being a battle between “pragmatism” and “ideology.” Senator Cory Booker, a co-sponsor of the Medicare for All bill, warns supporters it will be difficult to pass. Harris, the only candidate besides Sanders to advocate for the abolition of private insurance, said on the campaign trail only parts of the Green New Deal will be able to become law. As The Washington Post reported earlier this week, candidates are “being pressed from one side by core Democratic voters hungry for leftist policies favored by the most energized activists and, from the other, by the need to court centrist voters who could be alienated by the party’s turn to the left.” But they are also increasingly being pushed by members of the media to declare an allegiance between socialism and capitalism. The policies being advocated by some Democratic candidates are ambitious, but they hardly represent a turn toward socialism. Warren’s wealth tax, which would add a two percent levy to assets over $50 million, and Booker’s baby bonds, an innovative plan to curb racial inequality, would redistribute wealth, but don’t challenge the very structure of America’s economic system. The Green New Deal, which some candidates have embraced, is perhaps the most ambitious policy proposal to gain mainstream traction in decades, but it is not socialism, properly defined. While there are a number of Medicare for All proposals percolating, most do not involve a government takeover of the entire health care system, instead providing publicly financed insurance. It’s yet another sign of the degradation of our political discourse that anything that deviates from the economic status quo is deemed “socialist.” There is a worthy discussion to be had about the merits of the proposals being put forth by the early slate of Democratic candidates, but it’s not one we’re having now. Instead, too many are wasting time trying to answer questions whose answers are obvious, like whether or not Kamala Harris is a socialist. What is Democratic Socialism/ Social Democracy: The same thing or different? What is Universal Health Care? Critics Say Bernie Sanders Is Too Old, Too White, and Too Socialist to Run for President in 2020. They’re Wrong. If US Has $5.7 Billion for Trump’s Stupid Border Wall, What About Education, Healthcare, and Green Jobs for Real Americans? There’s now an official Green New Deal. Here’s what’s in it. Next Post Crazy in Chief: Why Don’t the Media Discuss Trump’s Mental Instability?